On Saturday I drove to downtown Saint Paul and was surprised that the road I normally take into the city was shut with barricades. After going into town a different way and driving near where I would have ended up, I could see the road that I would have taken was completely flooded over from the river. In fact, water would have been lapping up the side of my vehicle if I had been at a certain stop light. I couldn’t believe the flood! So I went to a vantage point, high above the Mississippi, the Kellogg Mall Park, and parked. I got out and stood at the edge of the railing and looked down, and as far as I could see was brownish rushing water. Raspberry Island in the middle of the river was pretty well submerged. 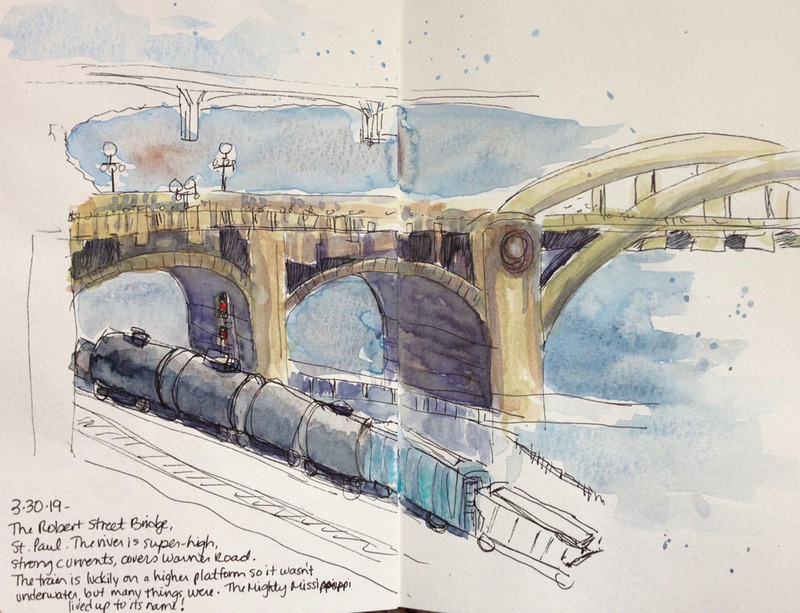 A rail line runs right along the river and under the Robert street bridge (pictured), so I decided to sketch the tank cars. Luckily the tracks are built up, so no water could reach them. I stood in the cold and wind and did a quick sketch, capturing the main elements—the cylinder-shaped tankers and other box cars, and parts of the bridge. I was so cold that after I got the lines down, I sat in my car and did the watercolor. I am working with a dagger brush now and find it works really quickly to fill in large areas and used on its side, detail lines go in very quickly. I worked on main washes then layered more paint to darken values. My only bright color was the red dots of paint for the signals! I was in awe of the floodwaters. They surged on, and I hope to get back to the city in a few days to see if they have gone down. Nature is sure powerful!